History: The Bellevue Board of Education purchased land for a new school on the eastern side of the Twin Ridge housing development after a $1,000,000 bond issue was approved in early 1963. They decided to name the new school Twin Ridge after the development it served, which had been named by developer R. Joe Dennis. 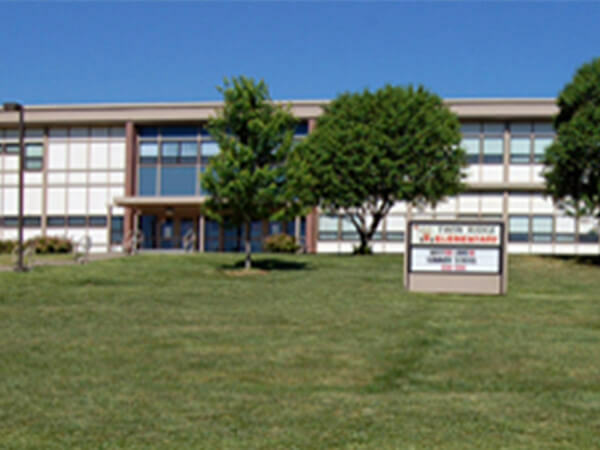 School Purpose: Twin Ridge Elementary School will strive to help every student meet academic success and to encourage students to work to their full potential. Work is full swing for the work scheduled for the renovation work included in the life safety /mechanical update project that is occurring at Twin Ridge. The new chiller is up and running and is cooling the building nicely! Anticipated delivery dates for the new wall mounted fin tube units in all of the classrooms were accelerated slightly so the final heating work should be completed by the first day of school as well. 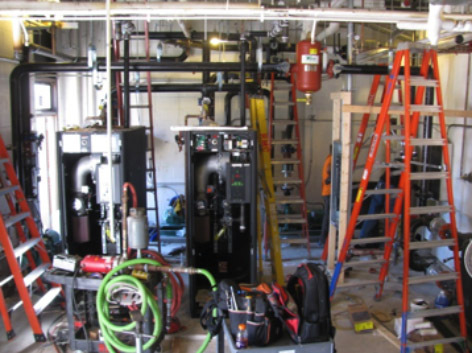 The new fire sprinkler system within the building is completed and the contractor is currently installing the new water main to the building to complete the connection. Work is full swing for the work scheduled for the renovation work included in the life safety /mechanical update project that is occurring at Twin Ridge. 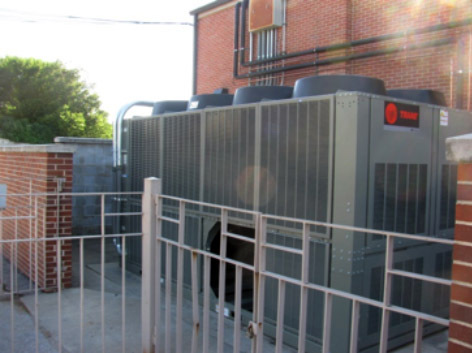 The new chiller has been installed and work in the main mechanical room for the new heating and cooling work will be completed by July 15th. The remaining work in the building for the fire sprinkler, intercom and technology installation, and the heating unit work within the classroom areas is scheduled to be completed by the first day of classes. Work is full swing for the work scheduled for the renovation work included in the life safety /mechanical update project that is occurring at Twin Ridge. Demolition work is ongoing on various mechanical and building components to prepare for new planned work. Most of the new mechanical equipment is scheduled to arrive on-site by the end of June and installation work being completed in July. Work on this project is on schedule for substantial completion the first week of August. Look for further updates as work progresses through the summer months. With the end of the 2016-2017 school year, contractors are starting to gear up for the start of renovation work for the life safety /mechanical update projects that are occurring at these schools. Work on these projects will begin in full on May 30th. Look for further updates as work progresses through the summer months. Work on all of these projects are scheduled to be completed by August 4th, 2017. Work has started in earnest at Twin Ridge Elementary School on the updating of the existing building mechanical systems. 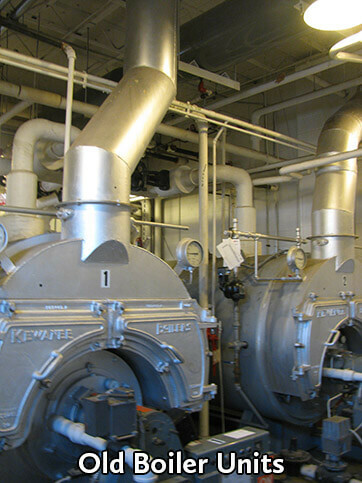 With the building heating season over, the existing boilers have been shut down and removed from the building and the new boilers are currently being installed. 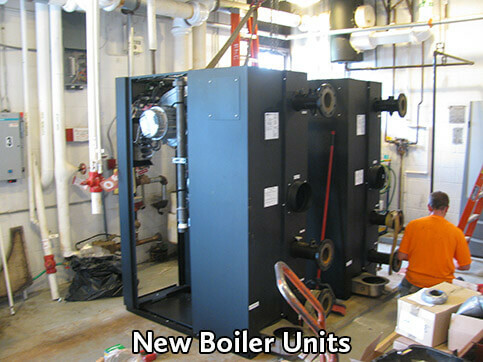 The new boiler systems will take up less than half of the area of the existing boiler systems and will also provide a much higher efficiency to reduce energy consumption! On April 3rd, 2017, the Bellevue School Board approved bids for the Life Safety and Mechanical Upgrades project scheduled for construction this coming summer. The Ray Martin Company of Omaha will be the prime contractor on the project. Some minor miscellaneous work will begin in and around the facility in late April/early May but will not affect ongoing school activities. The major components of work will begin on May 25th, 2017 and with an anticipated substantial completion on or around August 4th, 2017.